Given the choice between waffles and pancakes, I'll choose waffles every time. I don't know if it's because I like that waffles are crunchier, or because filling each little pocket with syrup brings me an inappropriate amount of joy.....but they'll be my choice every time. Sorry pancakes. It's not you, it's me. Now, since I live on an apple farm, and we make fresh apple cider every few days, I knew I needed to incorporate it into more recipes! (My apple cider doughnuts are still one of my favorites...recipe here!) I knew waffles would be a good fit, and was not disappointed. And what else would I choose to drizzle all over my waffles? You guessed it! Salted caramel sauce. Yes, I'm obsessed. No, I'm not sorry. At all. 1) In a large bowl, mix together all of your dry ingredients. 2) In a separate bowl, whisk your eggs until they're frothy. Then whisk in milk, apple cider, oil and vanilla. 3) Gradually add your wet ingredients to your dry, and mix until just combined. 4) Heat up waffle iron. Spray with cooking spray if needed once it's warmed up. 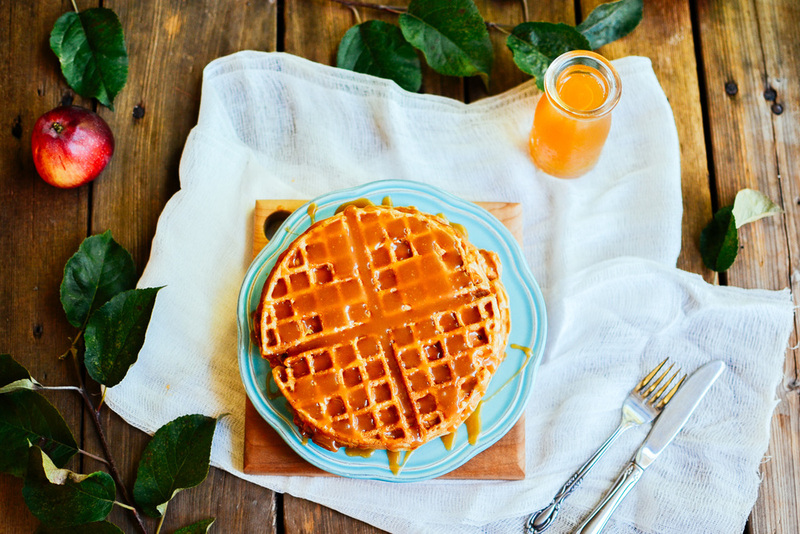 Pour batter onto the hot waffle iron. Cook until golden brown. Serve! 1) In a large saucepan, heat your sugar over medium high heat. Do not walk away from the pan! 2) Gently start swirl the pan once the sugar starts to melt, but don't stir. Keep an eye on it so that it doesn't burn. 3) Simmer until the sugar is completely dissolved and starts to turn an amber colour. 4) Wait until it's just a bit darker than the initial yellow colour, and then quickly add your butter, heavy cream and salt. Stir like crazy! This mixture will foam quite violently, so be careful. 5) Remove from heat and allow to cool down to room temperature before serving or placing in the fridge to store. The sauce will thicken as it cools. I love putting any leftover waffles in the freezer for later, and then will just grab one in the morning and toast it in the toaster. It gets nice and crunchy, and is a fun change from toast! And any leftover caramel is good on anything. Duh. Although it's especially yummy to dip apples in!